Ocracoke Island's popular folk band, Molasses Creek, is on tour this week. Below is their schedule. If you are in the area (Easton, MD, Westminster, MD, or Ashland VA) this is your opportunity to enjoy a bit of Ocracoke away from the island. 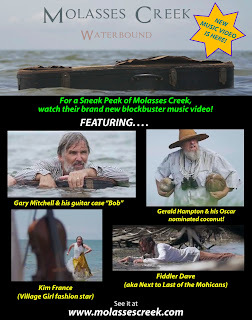 Molasses Creek has also produced a creative, new video as a promotion for their latest album, Waterbound. You can watch the video by clicking on the image below. The October 14, 1806 issue of The Wilmington Gazette reported news of a violent storm that caused much damage at Portsmouth and Ocracoke on this date, September 29 (and September 30), 209 years ago. "Shell-Castle [a small island between Ocracoke and Portsmouth], Sept 29 -- About 12 o'clock last evening a gale at ENE commenced and increased in its violence until about 4 a.m. when it shifted to ESE and blew the most tremendous storm, ever I believe, witnessed by a human being, until six o'clock, when it got further to the southward, and finally to WSW where it still continues to blow with excessive force." Nearly all of the "lighters" (smaller, shallow-draft vessels onto which cargo was transferred from larger vessels, in order to transport goods to mainland ports), as well as other schooners, were reported "sunk, ashore, or dismasted." The writer goes on to "add, to the tale of destruction, the total loss of the immensely valuable, philosophical and mathematical instruments of Col Tatham, [which] he yesterday put...on board the Governor Williams, for the purpose of having them conveyed to Newbern, and they are now buried with her in two fathom water." The cover photo above, on the most recent issue of the Nautical Research Journal (Autumn 2015,Vol 60, No. 3), is of a model of the Governor Williams made by Jim Goodwin, nationally recognized builder of ship models and ships-in-bottles. Village Craftsmen carries a large selection of Jim's models. The account of the 1806 storm, above, was quoted in Shipwrecks of Ocracoke Island by Sonny Williamson. By now, especially if you are on Facebook, you probably know about the copious amounts of rain we've had on Ocracoke over the weekend. Every low spot on the island was flooded. Howard Street, Lawton Lane, and many other streets have been barely passable. 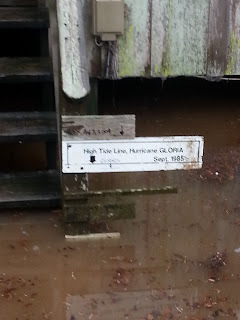 In fact, NC12 north of the Pony Pen was closed on Saturday because of flooding from rainwater and soundside overwash. The road was re-opened early Sunday morning. 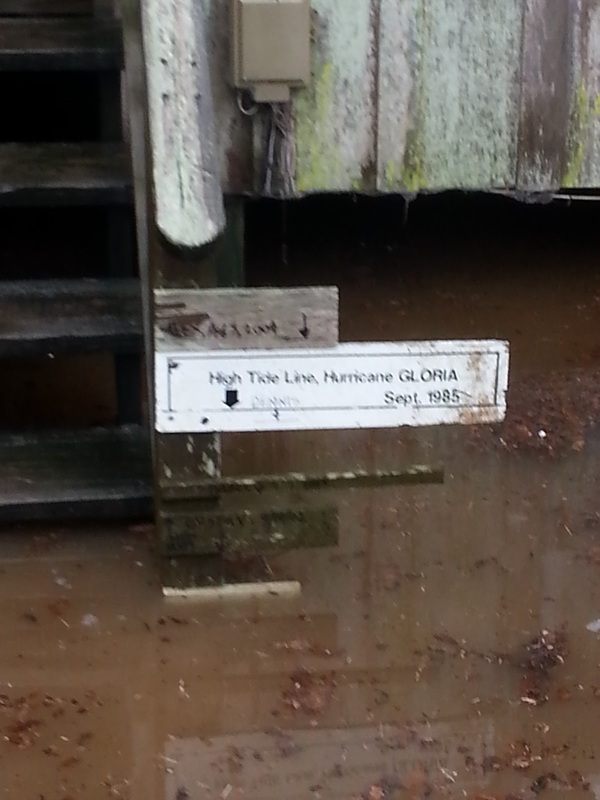 Here is a photo I took Saturday morning of the tide markers at Village Craftsmen. This is muddy, brown rainwater, not tidewater. More rain is in the forecast, but with periods of sunshine as well. It will be good when we finally dry out! This vintage photo, courtesy of the Outer Banks History Center, shows a herd of Ocracoke ponies traversing the sand flats on the island. Notice the power pole in the distance. The poles were erected along what is now NC Highway 12. 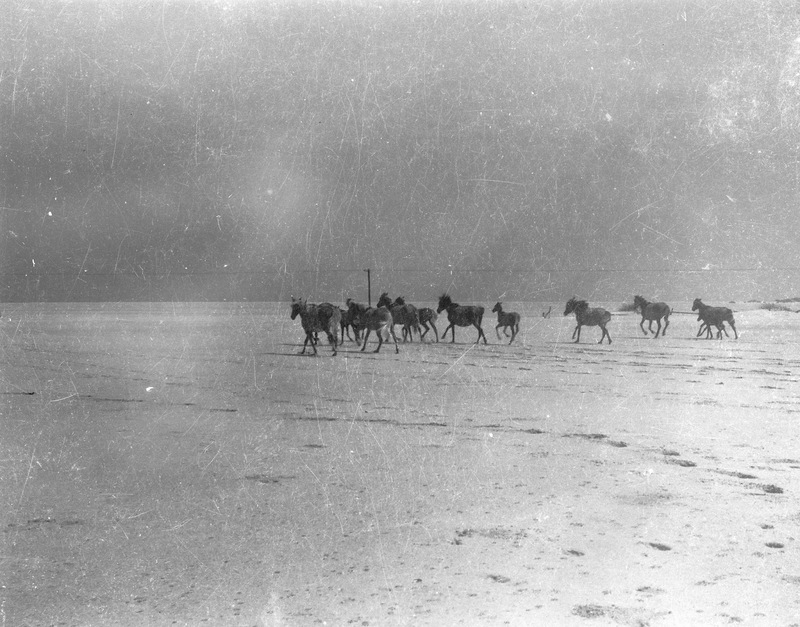 This photo was probably taken in the area called The Plains (between the edge of the village and the NPS campground). 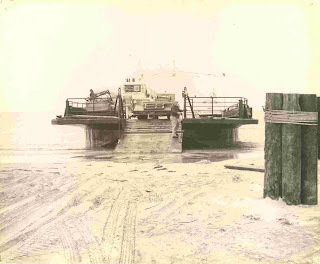 Before Hwy 12 was paved in 1957, and a continuous row of dunes artificially built up to protect the new road, the ocean periodically washed over the flats during exceptionally high tides. Today this area is thick with yaupons, myrtles, cedars and other vegetation. 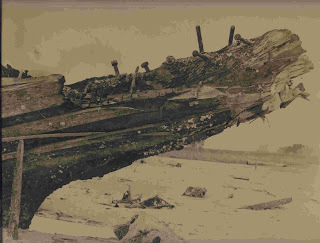 I recently came across this old photo of a portion (the bowsprit? or maybe one of the ribs?) of the 6-masted schooner, George W. Wells, that wrecked on Ocracoke Island in 1913. The Wells was one of the largest schooners ever built. A section of the wreck is occasionally exposed after storms and hurricanes, but is usually covered with sand. Dot Salter Willis and her father, Ben B. Salter, share stories and history in their book, Portsmouth Island. On page 81 they tell of the wreck of the two-masted schooner Sea Hawk. 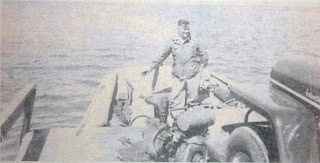 It was the fall of 1961 and Ben was with family and friends at their Portsmouth Island hunting lodge. Early in the morning as they were walking to check on their fishing nets, they heard a cry from someone down the beach. That's when they noticed the Sea Hawk sitting high and dry at the high water mark. 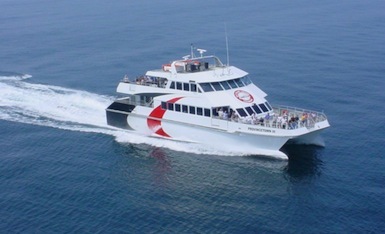 The Sea Hawk, en route from the Virgin Islands to Massachusetts on a stormy night, had sailed too close to land, and was washed ashore by the breakers. Ben relates that "They were scared people... A man took them over to Ocracoke and they went home in a few days. Later, they got the schooner off before she sanded up....I think this was the last schooner to come ashore off Portsmouth Island...."
As you walk along Ocracoke's beach you may occasionally stumble upon a chunk of coral. It is natural to wonder how coral comes to wash up on a North Carolina beach. According to Ann Marie D. Necaise, Steve W. Ross, PhD, and Andrea Quattrini in an article titled "North Carolina Reef Systems" published on the web site of the National Oceanic and Atmospheric Administration (NOAA), "Most people associate coral reef systems with tropical islands and warm, shallow waters. It may be surprising to learn that two unique types of reef systems exist off the coast of North Carolina." The authors go on to describe the Outer Shelf Reefs and the deeper Lophelia Coral Banks...and the colorful and diverse species of fish which live near the reefs. You can read more about these interesting North Carolina deep sea features here: http://oceanexplorer.noaa.gov/explorations/03edge/background/reef_systems/reef_systems.html. This month's Ocracoke Newsletter is a reproduction of a booklet written, illustrated, and published in the early 1960s by island school teacher Mary Williams. It is titled The Great Ocracoke Cat Hunt, and lovers of Ocracoke and cats should find it quite entertaining. You can read it here: http://www.villagecraftsmen.com/news092115.htm. As our second post in a series about names of Ocracoke landmarks (you can read our first post, "Miss Elsie," here) today I share some information about Jackson Dunes. Many of our readers are familiar with this area at the eastern edge of our village. 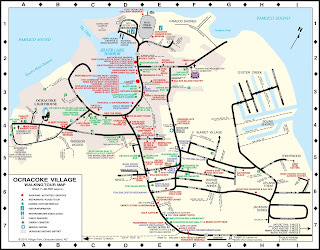 It is a small development of mostly newer homes and rental cottages, although at one time it was mainly populated by one of Ocracoke's first families, namely the Jacksons. Every islander and many visitors know Jimmy Jackson and his son Jamie Jackson, our only commercial auto mechanics. Most weekdays they can be found at "Jimmy's Garage" across the street from the Pony Island Restaurant. The earliest Jackson of record in coastal North Carolina was Issac Jackson, a carpenter and cooper who lived in Bath County. He was born about 1655. Isaac's son Thomas and his wife (name unknown) had two sons, Isaac and Francis. 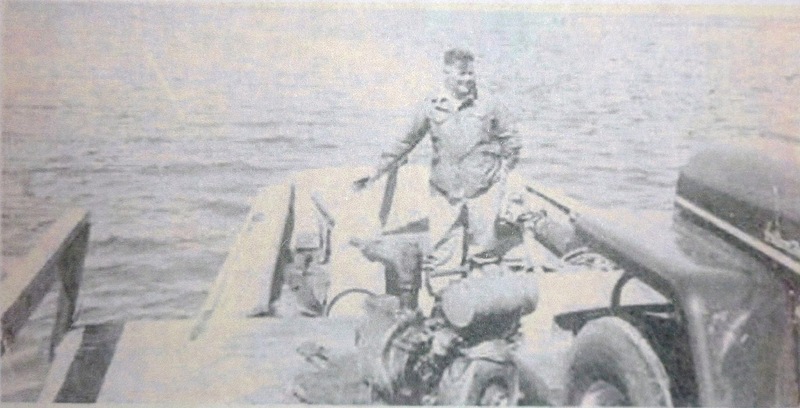 Francis Jackson was an early pilot at Ocracoke. 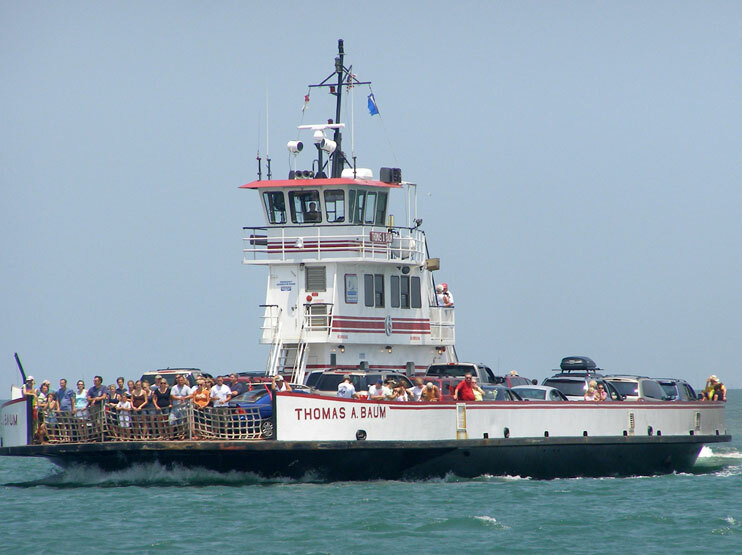 In 1715 the NC General Assembly passed an act to settle pilots at Ocracoke Inlet. Almost all ships bound for ports on the mainland of North Carolina passed through Ocracoke Inlet, the only Outer Banks inlet that has been continuously open since Europeans began keeping records. Ship captains wanted someone with local knowledge of channels, shoals, and water depths to come aboard as a pilot to navigate their vessel across the bar, and bring it into the deeper waters of Pamlico Sound. Jimmy and Jamie are direct descendants of Francis Jackson (ca. 1723-1798). Francis Jackson married Susannah Howard, daughter of William Howard, Sr., early owner of Ocracoke Island. Jimmy and Jamie are 9th & 10th generation O'cockers, respectively. In 1762 William Howard and John Williams sold 100 acres to Francis Jackson and in 1764 an additional 100 acres. At one time Francis Jackson owned several hundred acres of land on Hatteras and Ocracoke islands. At his death he still owned land on Hatteras as well as a large tract on Ocracoke. Francis Jackson left no will, and the court appointed five men to divide the estate among his relatives. This was done, and the transaction was recorded in 1802. Francis Jackson, Jr. added to his share by purchasing one of the other portions. This area is now known as Jackson dunes. The Ocracoke Jacksons descend from Francis Jackson, Jr. and his wife Sarah, and ultimately from Francis Jackson, Sr. and from William Howard, Sr. through his daughter Susannah. Dr. Samuel Dudley (1790-1874), originally from New Hampshire, became the resident surgeon at the Portsmouth Island Marine Hospital in 1829. His oldest child, Augustus Dudley (1831-1912), was a merchant on Portsmouth Island at the outbreak of the Civil War. During the war, Augustus Dudley became a sutler (a civilian merchant who sells provisions to an army in the field). After the war, Augustus Dudley filed claims with the US Government for the loss of nearly $10,000 worth of his property. This included $1,415.00 for unpaid items taken from him by Union officer Dr. John M. Davis for use in the Marine Hospital. Property and services included a scow dismantled for firewood, 20 stoves, a beef cow, 8 cords of wood, various hospital supplies, and 49 days use of his schooner Annie. Additional items lost included another of Dudley's schooners, the C. A. Johnson, destroyed and sunk by Union troops when they negligently and ineptly removed the mast to use for a flagpole ($5,500) and various items removed from a store at Hatteras ($3,000). According to Augustus Dudley, he was in the Union lines every hour of the time from the fall of Hatteras on the 29th day of August, 1861 until the war ended in 1865, and was "loyal to the U.S. Government every hour of his life." Early in the war Confederate forces had captured "a good portion" of his property ("worth upwards of Nine Thousand Dollars"). Dudley was threatened, arrested, and imprisoned by the Rebels. For these losses "there was nothing received and nothing promised and nothing expected." However, after Federal victory at Hatteras he felt that he would be protected, and compensated for property and services taken by the Union army. But as late as 1905 he had never been remunerated for the loss of his property. No records indicate that Augustus Dudley ever received compensation, although it is possible that his widow or other heirs may have eventually collected on the claims. This month's Ocracoke Newsletter is the story of whale and porpoise fishing on the Outer Banks. You can read it here: http://www.villagecraftsmen.com/news082115.htm. Captain James Best (1791-1846) and his wife Nancy Howard Best (1801-1857) are buried in the old George Howard cemetery near the British Cemetery. On October, 1846, a public sale was held to dispose of Capt. Best's property, and to pay bills due. The sale brought in $136.98. Following are a select few of the items sold, and their sale prices. Much of the rest included household items (furniture, stoves, linens, kitchen utensils & crockery), livestock, tools, and nautical items (2 "Beuys," blocks, and a lead line). During his lifetime Capt. Best was owner and captain of a 54 ton schooner, Louisa, and, later, the owner and master of the schooner Little John. The other day, as I walking across the lane to visit Cousin Blanche with friends, we spotted this Eastern Box Turtle slowly making its way to the cover of a nearby thicket. It was about 6 inches long. 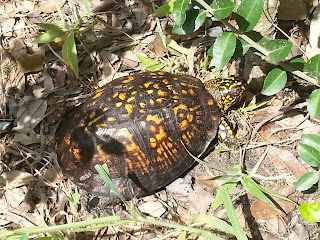 The Eastern Box Turtle (Terrapene carolina carolina) is the only land turtle found in North Carolina, and has been designated the state reptile. Individuals can live more than 100 years. I always enjoy stumbling across turtles, and was especially happy to see this one in the neighborhood since, because of its very slow movement and low reproductive rate, this species is considered "near threatened" or "vulnerable." If you visit the Ocracoke Post Office, there is a good chance you will be greeted by the friendly face of Milissa Garrish. Melissa is a native islander, the daughter of Danny Garrish and Margaret Garrish. She graduated from Ocracoke School in 1981. The June 10, 1981 issue of the Ocracoke Island News ran a full page article on the nine graduating seniors. It was accompanied by caricatures by Kitty Martin Mitchell. 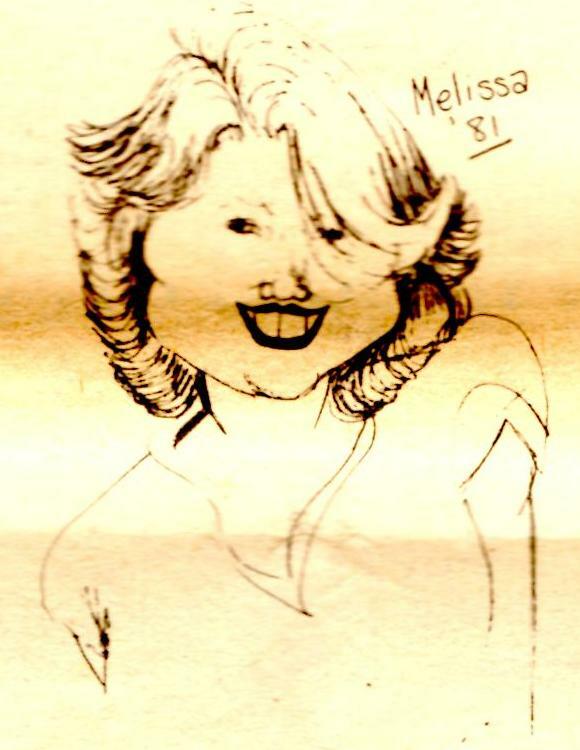 The paper described Melissa as "a former cheerleader and basketball player. Melissa has served as advertising manage for both the school newspaper and yearbook. A member of the homecoming court, her hobbies include singing and reading. Melissa plans to stay on the island and continue working as the Community Store." Melissa later took a job with the Post Office, and continues to serve our community in that capacity. She is a dedicated employee, as well as a devoted wife & mother, and a willing volunteer for community organizations. When you next visit the Post Office tell Melissa you saw her "picture" in the Ocracoke Journal! Recently, my neighbor Ed sent me an email with this link from The Washington Post: http://wapo.st/1IAjiii. The article asks, "When you're hanging out at the beach and you gaze off into the horizon, do you know what is across the ocean from you?" It turns out that Casablanca, Morocco, in North Africa is located at 33°32′N Latitude. 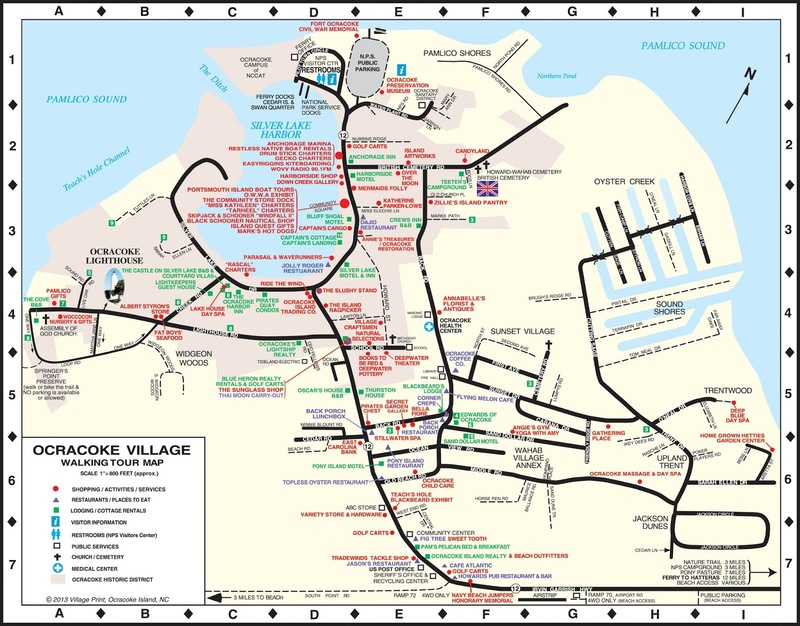 Ocracoke is situated at 35°6′N Latitude. Ocracoke and Morocco are almost directly across the Atlantic from each other. Ed went on to note that "when I walk on the beach in the morning I often find coconuts on the beach. Any idea of where they come from?" My guess is that coconuts that wash up on Ocracoke's beach come from the Caribbean. Because of ocean currents, especially the Gulf Stream, I think it is most likely that these coconuts travel up the coast from the south, not across the ocean from Morocco. Any other thoughts on this subject? Over the years I have heard islanders relate the story of one native (who died years ago, and shall remain unnamed) who was briefly married to a floozy from up north. The young bride remained on the island for several months while her husband returned to Philadelphia to work on dredges on the Delaware River. While he was away she made the acquaintance of several island men. The husband's father was heard to remark with scorn about his new daughter-in-law, "She's fine cattle, she is." Although this is not a common expression nowadays, its meaning is clear enough. The 1891 book, Slang and Its Analogues Past and Present: A Dictionary ... with Synonyms in English, French ... Etc., Compiled by J.S. Farmer [and W.E. Henley], Volume 2, defines "cattle" as "A term of contempt applied to human beings." Samuel Taylor Coleridge, in the early 19th century, had this to say about the Duchess of St. Albans: "Another Highgate neighbor ... complained about the noisy stream of 'Carriages, Coachmen and other such Cattle' convening on the spectacular house of the duchess...."
Just one more example of an expression on Ocracoke that lingers on from days gone by. 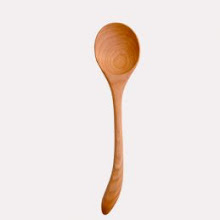 Fortunately, there is not much occasion to use it today. Have you ever wanted to visit the Outer Banks and stay in a rental cottage with a commanding view of the water? Perhaps a 5,000 square foot "cottage" with a 360 degree panoramic view of the Atlantic Ocean? Well, one day that dream might be available to you. 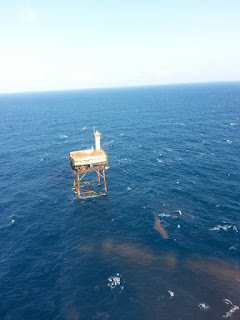 In 2012 Zap Water Technology, Inc purchased the Diamond Shoals Light Station, located 13 miles off the coast of Cape Hatteras in the "Graveyard of the Atlantic." 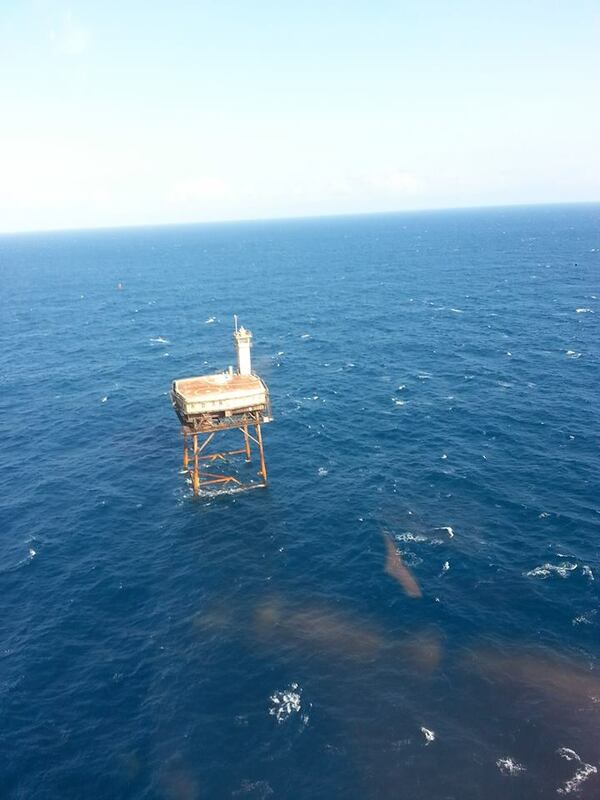 It was built on 4 pylons embedded 150 feet in the sea floor, and was activated in 1966. The Station was decommissioned in 2001. 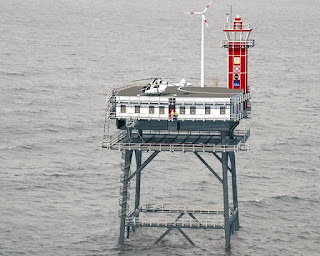 The Light Station includes 7 bedrooms, a recreation area, a kitchen, an office, storage space...and, of course, a helicopter pad! Photos below courtesy of Dave Schneider and Zap Water Technology. Dave Schneider, the President of Zap, plans to restore the Station, and to establish an '"on ocean" technology and recreational center. Work on the station continues as I write. Below is a 3D picture that the Alexander Design Group did for Dave Schneider and Zap Water Technology. It illustrates how the owners envision the facility when restoration is completed. You can also read an article about the Light Station and Dave Schneider's plans for it here: https://www.townebank.com/about-towne/news/towne-today-newsletter. (Click on "Richmond Towne Today...View Our Debut Addition." The National Park Service (Outer Banks Group) has announced its Fall Program Schedule. Programs will begin Tuesday, September 8, and will continue through Monday, October 12. Programs are also scheduled at Cape Hatteras, Fort Raleigh Historic Site, and the Wright Brothers National Memorial. More information is available here. One afternoon he was in the post office lobby when a young couple came in with a large stack of wedding invitations to mail. 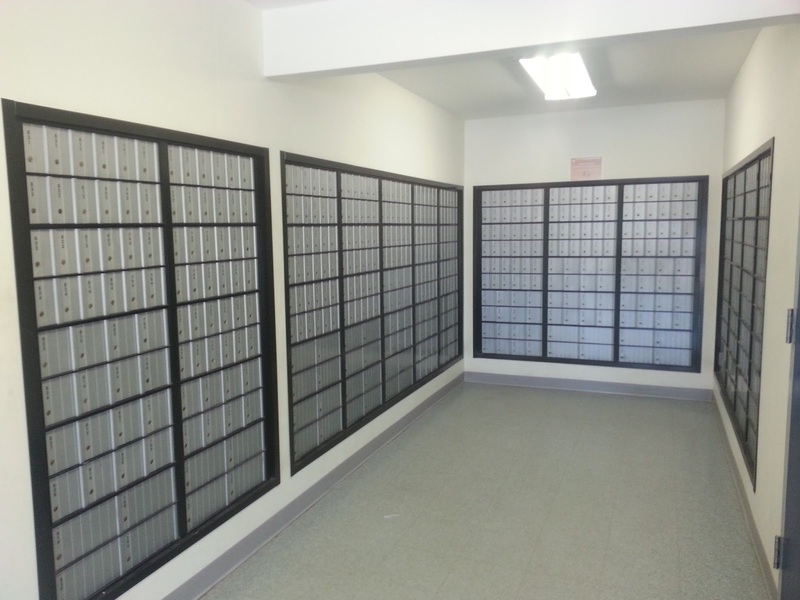 "Celeste," the young lady said sheepishly, "we're sorry, but we don't know most of these people's post office box numbers. Can we mail them anyway?" After some time Celeste hesitated. It was then that Tom piped up from across the lobby. "A hah," he chortled, "I was waiting for you you to stumble!" Celeste just cut her eyes at Tom, and explained calmly, "That person has two post office boxes. I was trying to decide which one was best to use!" Chastened, Tom walked over and gave her a congratulatory "high five." One of the most interesting stories in biology is the relationship between figs and tiny, almost microscopic, fig wasps. I have addressed this topic before, about 3 1/2 years ago, but it is worth repeating. The story is told in Chapter 10 ("A Garden Inclosed") of Richard Dawkins' 1996 book, Climbing Mount Improbable. Dawkins, an articulate science writer, introduces this final chapter by writing that he is "finally ready to return to the most difficult and complicated of all my stories." I have read that chapter several times (it is absolutely fascinating). I always think I've understood it, but then realize I don't really, because I become thoroughly confused trying to explain it to anyone else! Although I have no doubt that Professor Dawkins understands figs & fig wasps, and that he has explained the relationship accurately, I began to wonder if Ocracoke Island figs are actually pollinated by fig wasps. Fig trees on Ocracoke seem always to start as cuttings (or branches that bend down and root). I've never known of a fig tree to sprout from a seed. So I did a little research and discovered this: "[Figs that have been fertilized] are more likely [to come] from Turkey or other locations in the Middle East. This is because the fig wasp, which is needed for fertilization, is native to these countries, and will have, more than likely, fertilized the figs you purchase." (http://www.ehow.com/way_5452523_growing-fig-trees-seed.html). Upon further reading I learned that, unlike figs that require pollination by the fig wasp,...Common figs do not need pollination; they have all female flowers, and the "fruit" develops through parthenocarpic means (production of fruit without fertilization of ovules). This includes the varieties of figs commonly grown on Ocracoke, e.g. Brown Turkey and Celeste. (see https://en.wikipedia.org/wiki/Common_fig#Propagation). So...read and enjoy Dr. Dawkins' chapter on figs and fig wasps, but don't hesitate to enjoy Ocracoke fig products. They won't contain wasp larvae! In the Spring of 1981 Ocracoke students in grades 3 - 4 made a field trip to Winston-Salem. They spent the first night at Reynolda House, the mansion built by R. J. Reynolds, where they enjoyed viewing art...and playing billiards, bowling, and racketball. The next day they toured Old Salem, then spent the night in Chapel Hill. In Chapel Hill they enjoyed lunch at the Rathskeller (sad to say, this popular eatery closed in 2007), then visited the Morehead Planetarium. That evening the students were treated to a magic show. On the way home they stopped in Raleigh to tour the Museum of Natural History and the Old Capital Building. "The trip started out badly. The ferry ride across to Swan Quarter was a little rough [definitely an understatement!, but then this was written by a native islander] due to a storm, and almost everyone got seasick. There were times when the boat rocked so much that the sky was all that could be seen out of one window while the water was all you could see from the other.... The children had hoped to have a picnic lunch on the way and had packed lunches, but this was made impossible due to the weather." I spent most of my time helping one student or another to the bathroom, where the doors to the stalls were often swinging violently from one side to the other. In time, when there was nothing left in most of the student's (and most of the teacher's and chaperone's) stomachs, nearly everyone stretched out on the seats and fell asleep. 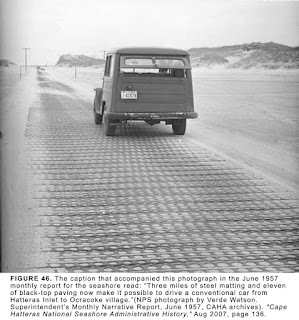 In the past I have written about the first paved road between Ocracoke Village and Hatteras Inlet. 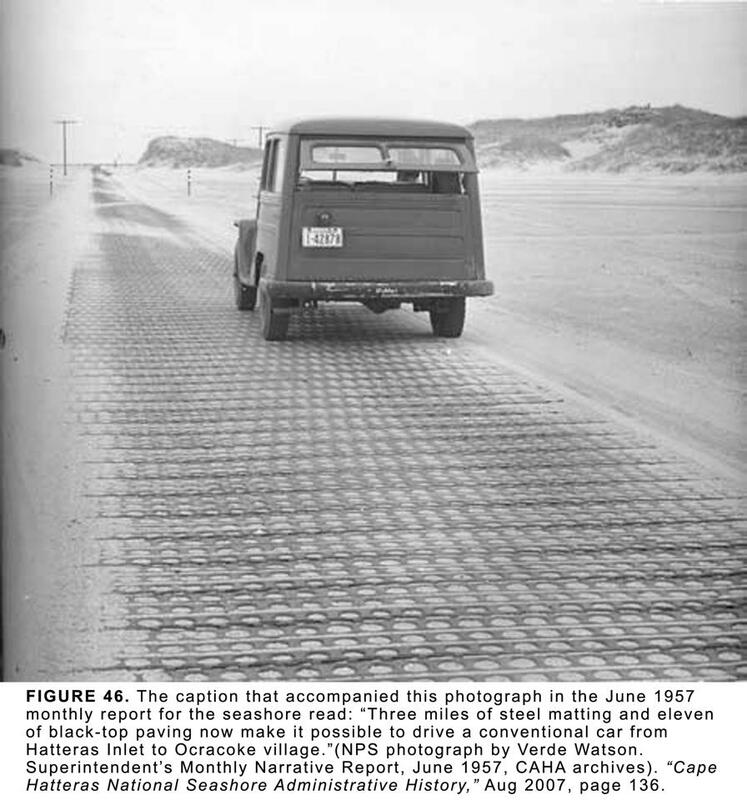 Eleven miles of what was to become NC Highway 12 was paved in 1957. The last three miles (at the north end of the island) was a single lane of WWII metal landing mats (with "pullovers" every half mile for passing oncoming vehicles). Unfortunately, I never had a good photograph of that early highway. A few days ago my daughter, Amy, was given the following picture from the NPS archives via John Havel. The photo was taken by Verde Watson (1903-1978), first chief park naturalist at Cape Hatteras National Seashore, between 1955-1961. Please keep in mind that this road was a great improvement. Prior to 1957 travelers arriving on Frazier Peele's 3 or 4 car ferry had to drive on the beach (between high and low water marks) to get to the village. 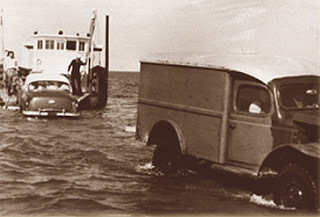 Getting to Ocracoke in those days was quite an adventure!